With over half a century of experience in agricultural excellence and now the distinction of the longest standing international supplier of hay worldwide, Anderson Hay has earned an impeccable reputation among customers. Our reputation is a reflection of who we are, and the foundation of our success lies in our long standing relationships with our customers, growers, suppliers, and employees. With over half a century of experience in agricultural excellence and now the distinction of the longest standing international supplier of hay worldwide, Anderson Hay has earned an impeccable reputation among its customers. Their reputation is a reflection of who they are, and the foundation of their success lies in their long-standing relationships with customers, growers, suppliers and employees. 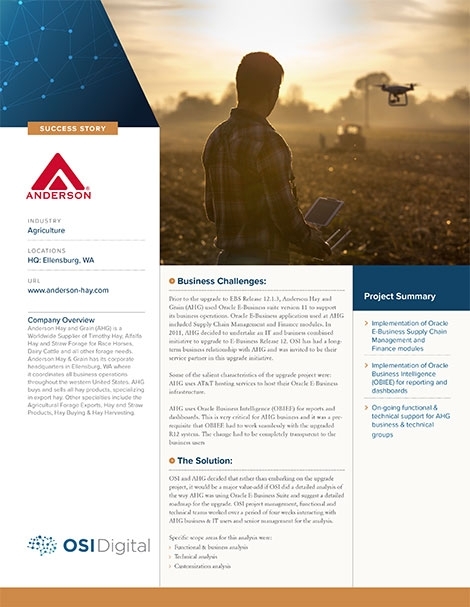 Prior to the upgrade to the EBS Release 12.1.3, Anderson Hay and Grain (AHG) used Oracle E-Business suite version 11 to support its business operations. In 2011, Anderson decided to undertake an IT and business-led initiative to upgrade to E-Business Release 12. OSI Digital has had a long-term business relationship with Anderson and was invited to be the services partner for the upgrade initiative. This upgrade was critical to Anderson and it was a pre-requisite that OBIEE had to work seamlessly with the upgraded R12 system. The change had to be completely transparent to the customers’ business users. OSI Digital and AHG decided that rather than embarking on the upgrade project, it would be a major value-add if OSI did a detailed analysis of the way AHG was using Oracle E-Business suite and suggest a detailed roadmap for the upgrade. OSI project management, functional and technical teams worked over a period of four weeks interacting with AHG business & IT users and senior management for the analysis. OSI conducted a detailed analysis of the way AHG was using Oracle E-Business suite and suggest a detailed roadmap for a successful upgrade.